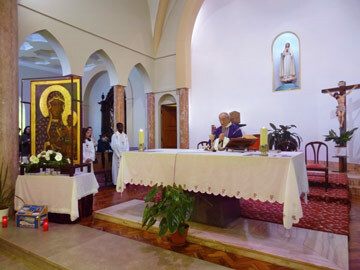 This past weekend, from March 8-10, the Icon of Our Lady of Czestochowa was in the Chapel of the Consolata Missionaries in Fatima. This missionary institute is present in 24 countries, including Poland. They welcomed the Virgin Mary with much joy and organized moments of prayer in the presence of Mary, always with the intention that is associated with this pilgrimage: to pray for the respect of human life. The Icon was also venerated by individual people and pilgrim groups that were in Fatima at this time. On Sunday, at 11:30am, the chapel of the Consolata Missionaries was filled for Holy Mass. In his homily, the missionary Darci Vilarinho, referring to the readings of the day, invited the faithful to be always aware of the value of human life, respecting it from conception till natural death. At the end, with the eyes turned to Mary, people recited the prayer to Our Lady in defense of life, composed by Blessed John Paul II, in his Evangelium Vitae. 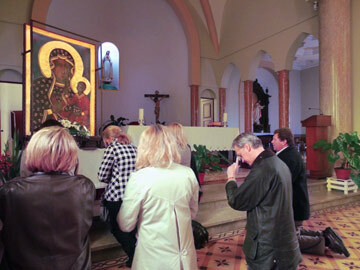 Beading farewell, many people got closer to the Icon and stayed there in personal prayer, including a group of families from the Eastern countries from Europe.